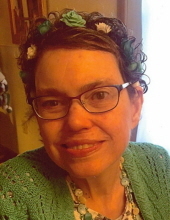 Mary Anne Reinhart, age 56, of Eaton, OH passed away Monday, March 25, 2019 at Vancrest Health Care Center in Eaton. She was born December 28, 1962 in Dayton, OH to Carolyn Sue (Jung) Reinhart and the late William A. Reinhart. She was a member of Visitation Catholic Church in Eaton; and worked for many years at L&M Products. She is survived by her mother Carolyn Sue Reinhart; sisters Melissa Benline, Thelma (Alan) Halderman and Nancy Nave; numerous nieces and nephews; several great nephews; and many special friends and caregivers that touched Mary Anne’s life. Mass of Christian Burial will be held at 10:00 am on Saturday, March 30, 2019 at Visitation Catholic Church, 407 East Main Street, Eaton, OH. Burial will follow at Roselawn Cemetery in Lewisburg, OH. No public calling hours. Girton Schmidt & Boucher Gard Funeral Home, Eaton is assisting with arrangements. In lieu of flowers, memorial contributions may be made to Hospice of Dayton, 324 Wilmington Ave., Dayton, OH 45420. Online condolences and other remembrances may be sent to the family by visiting www.gsbfuneralhome.com. To send flowers or a remembrance gift to the family of Mary Anne Reinhart, please visit our Tribute Store. "Email Address" would like to share the life celebration of Mary Anne Reinhart. Click on the "link" to go to share a favorite memory or leave a condolence message for the family.